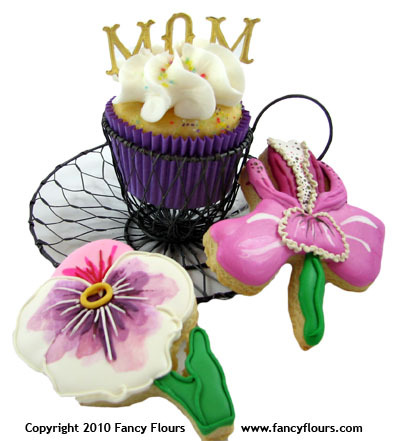 This entry was posted in Announcements, Spring Baking and tagged Cookie Recipes & Ideas, cupcakes, fancy flours, fancyflours, mother's day, orchid, pansy, tea, teacup by Fancy Flours. Bookmark the permalink. Are there directions on how to achieve the water color effect on the pansy? The water color on the cookie was most likely painted on the dry royal icing base. You can do this by using gel coloring and diluting it with a bit of water to achieve the desired color. Dab your brush on a paper towel to remove excess moisture. Your items are beautiful, fun and crazy! do you sell any of your items at wholesale prices?